Horn also extended a special thanks to Marcum’s close friend Jim Johnston for bringing the issue to his attention and recommending the legislation. Editor’s note: A print-quality photograph is available by clicking on the image or by visiting the senator’s website at: www.SenatorKenHorn.com. Click on “Photowire” under the Media Center tab. 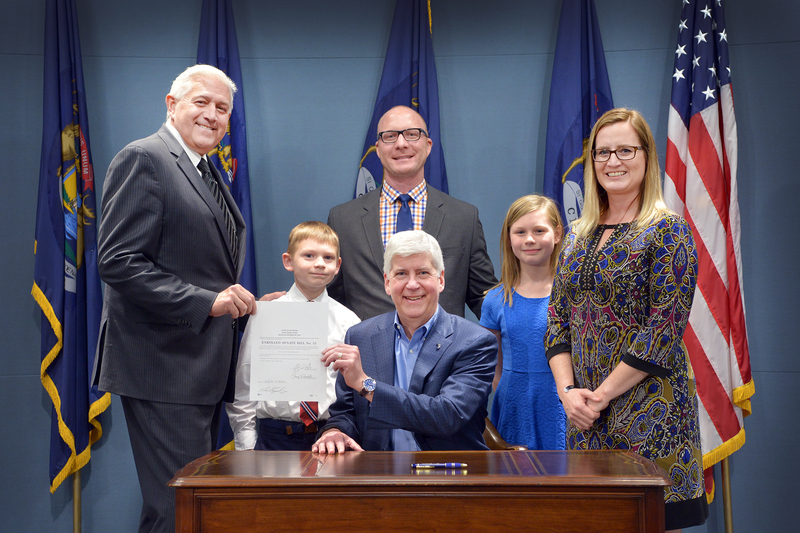 Photo Caption: State Sen. Ken Horn poses for a photo with Marcum’s sister Kaylee, her husband Dave and their two children Grace and Carter Pierle as Snyder signs Senate Bill 51 into law as Public Act 39 of 2016.